The MS Series inverter/charger is a pure sine wave inverter designed specifically for the most demanding mobile and off-grid applications. The MS Series is powerful, easy to use, and cost-effective. 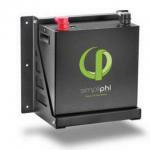 MS-series inverter/chargers are available in 12-, 24- and 48-volt versions. The 48-volt MS4448-AE has 120/240VAC output, eliminating the need to stack two units or buy a transformer to run 240-volt loads. Install the MS Series in four easy steps: simply connect the inverter’s output to your distribution circuits or electrical panel, connect AC power from the utility or generator to the inverter’s easy-to-reach terminal block, connect the batteries, and switch on the power. Mount the MS Series on a shelf, bulkhead, or even upside down. The lightweight aluminum base and cover provide noise reduction and corrosion resistance. The MS Series has an RS485 communication port for network expansion and a remote control port. The extra-large AC-access cover with terminal screw block and 360° DC connection terminals with covers make the inverter wiring accessible when it needs to be. The MS Series front panel has an on/off switch with an easy-to-read LED indicator. All models have a 50-amp transfer relay. 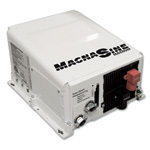 MS inverters can be series stacked, using the ME-SSI, for 120/240 VAC operations. 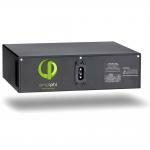 The MS Series is ETL Listed to UL/cUL 458 for mobile use and UL 1741 for off-grid installations. Dimensions: 13.75" x 12.65" x 8". 3-year warranty, except MS4024-AE and MS4448-AE which has a 2-year warranty.